Europa Virgo [Europe personified as a woman.] - MÜNSTER, S.
Title : Europa Virgo [Europe personified as a woman.]. Size : 10.1 x 6.4 inches. / 25.7 x 16.2 cm. 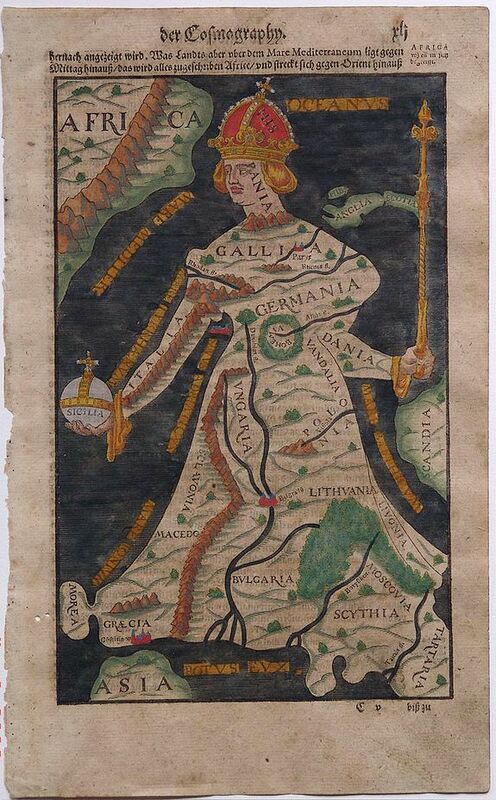 Description :From Cosmographia and showing the continent (west at the top) with the Iberian peninsula as the head with crown, Italy and Denmark as the arms, carrying an orb and sceptre, and Greece, Bulgaria and Tartary as the hem of the gown. Countries, some cities, rivers, seas, forests and mountains have Latinised names. Condition : Wood cut print, age-toned as usual, two small wormholes in margin, not affecting the map.